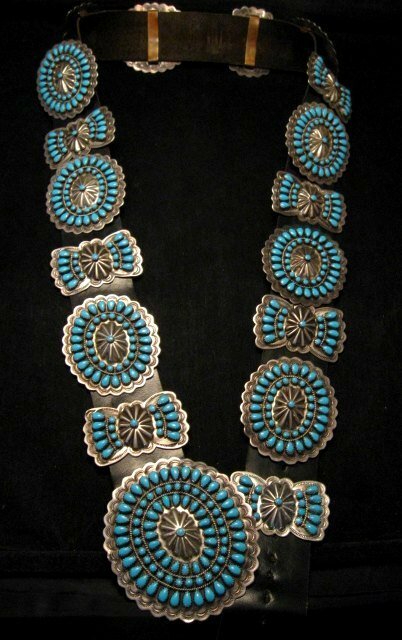 This incredible old Navajo sterling silver and turquoise concho belt dates back to the 1970s or so and was retrieved from one of our favorite pawn shops in Gallup, New Mexico. This pawn shop is a true New Mexico pawn shop that has been serving the needs of its Navajo, Zuni & Hopi clients for many generations. 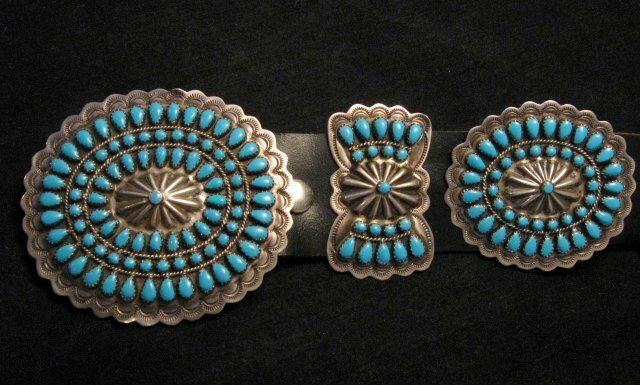 This is a wonderful turquoise cluster concho belt. You will absolutely love it. 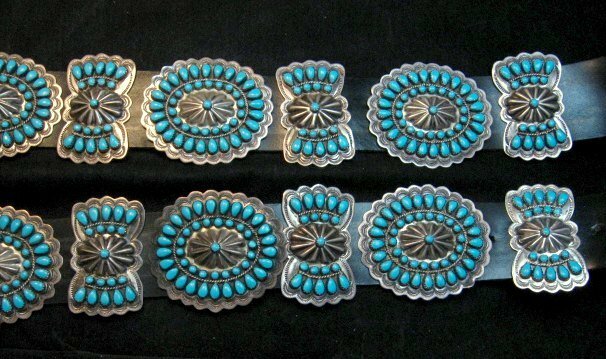 While I was in Gallup, I saw a similar block turquoise concho belt for sale in the famous Richardson's Pawn & Trading Post for $4000. But the belt we are selling here is much, much nicer and much less expensive! 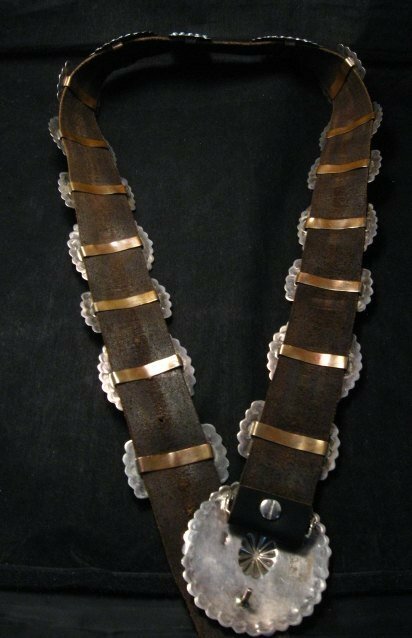 The concho belt consists of the buckle plus eight oval conchos and nine butterflies. 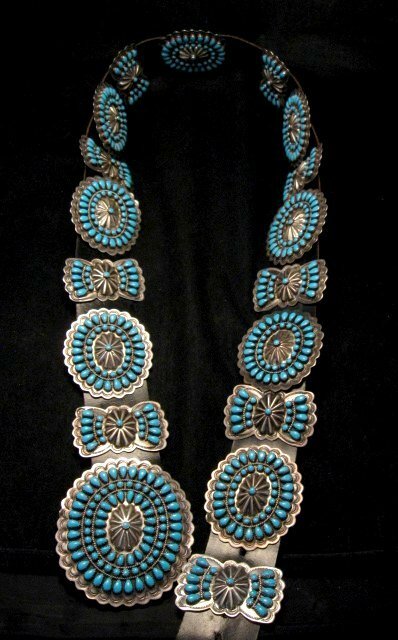 The conchos measure 2-1/4" by 2" and they are set with 44 turquoise cabachons. The butterflies measure 1-1/4" by 2" and they are set with 19 turquoise cabs. 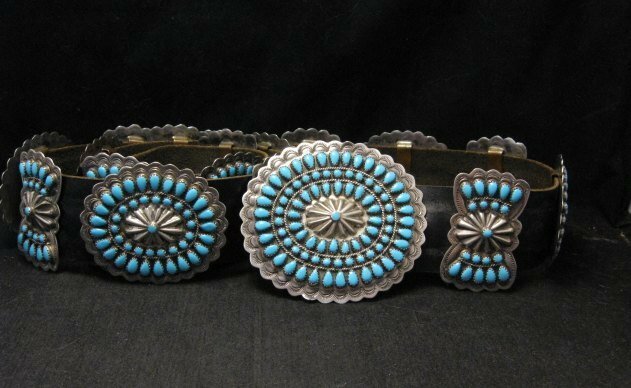 The buckle concho is slightly larger than the other oval conchos on the belt; it measures 3" by 2-3/4" and it is set with 84 turquoise cabs. The pawn shop owner who sold this belt to me believes that the turquoise used on this belt is block, also known as reconstituted turquoise. Reconstituted turquoise contains pulverized turquoise stone, which is then mixed with epoxy to form hard cakes or blocks that are then cut into "stones" and set in jewelry. 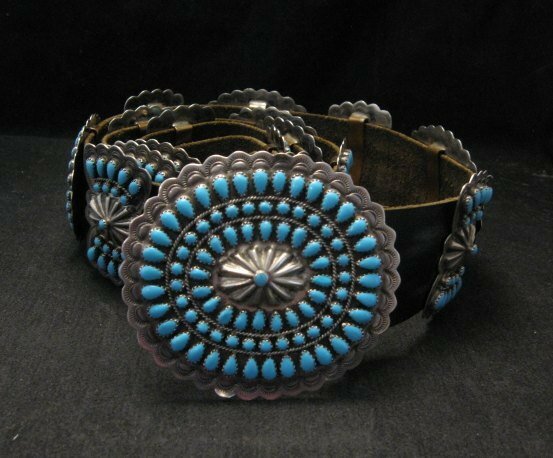 The Navajo often use reconstituted turquoise in the belts they make for themselves because it makes the belt more affordable and more usable for everyday wear, since the synthetic turquoise won't chip, break or turn color. The 1-1/2 inch wide black leather belt has a total length of 42 inches, and there are several holes punched at the 32-1/2, 36, 37, 38 positions. 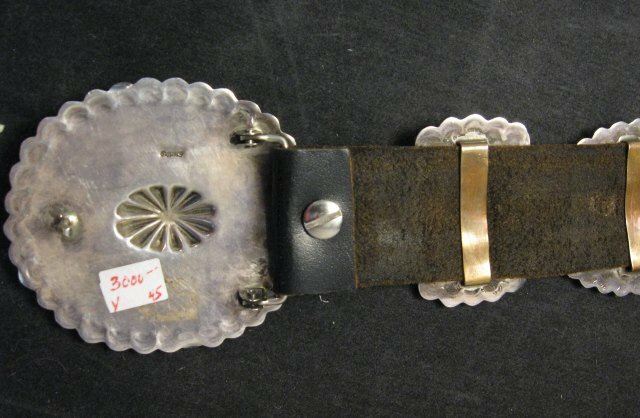 Additional holes can be punched as desired and the conchos are movable, making adjustment possible. You could remove conchos to fit an even smaller waist size. The back of the buckle is stamped Sterling. No hallmark indicating the maker. Excellent condition.